The Edelbrock Performer RPM Aluminum Cylinder Heads feature threaded inserts in the rocker studs and exhaust manifold bolt holes for superior strength and durability. 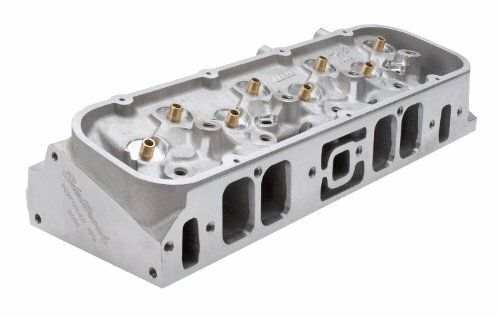 This complete head includes stainless steel, one-piece, swirl-polished, hardened tip 2.09 intake and 1.66 exhaust valves. They offer improved power throughout the RPM range for greater throttle response and top-end horsepower. These 428 Cobra Jet-sized valves promote excellent flow for streetable power and will clear 4.050" bores on 390 engines. 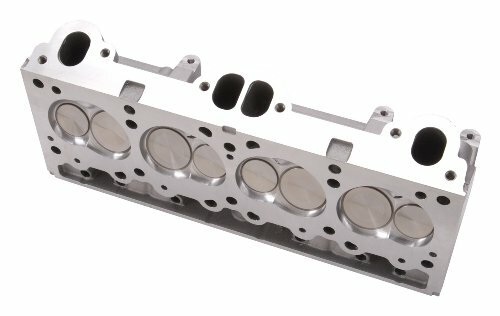 These cylinder heads feature 72cc combustion chambers, are not port matched or bowl blended, and are designed for stock replacement valves. The Rocker Shaft Stud Kit #6009 provides better rocker shaft retention and is highly recommended for use with the Edelbrock FE heads. It eliminates wearing of the threads and the possibility of bottoming the rocker shaft bolts in the head. The Edelbrock Cylinder Head offers improved performance throughout the RPM range for great throttle response and dyno-proven increases in horsepower. Top quality features include threaded inserts in rocker studs and exhaust bolt holes for superior strength and durability and manganese-bronze valve guides. This cylinder head retains an exhaust crossover passage and is a street legal replacement part. It features intake and exhaust port openings that are CNC machined and designed for maximum flow velocity. This head is available with stainless steel intake and exhaust valves with undercut stems, 2-ring positive oil control seals, rocker studs, hardened steel guideplates, valve springs, retainers and keepers. Performer Pontiac heads utilize a D-Port exhaust port configuration for use with standard D-port exhaust systems. They are designed for 1962-79 389, 400, 421, 455 cid V8 Pontiac engines with a 4.060in. or larger bore. They feature optimized oil return passages for increased oil flow. These heads are available in three heart shaped combustion chamber sizes, including 65cc, 72cc and 87cc. 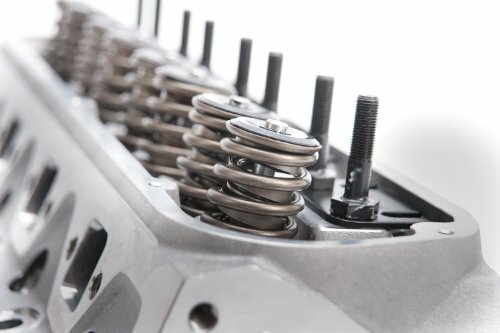 The 65cc combustion chambers are as-cast while the 72cc and 87cc chambers are fully CNCd to provide a 9.5:1 compression ratios when used with flat-top pistons. The spark plug has been relocated closer to the exhaust valve for improved performance. These heads are cast with extra thick port walls and a compact port size, making them ideal for CNC and hand parting. Complete heads include guide plats, rocker studs and high quality valvetrain for direct bolt-on application. Head crossover machined for 50-state emissions legal performance. Cylinder Head Specifications: Combustion chamber volume: 118cc; Intake runner volume: 315cc; Exhaust runner volume: 110cc; Intake valve diameter: 2.19"; Exhaust valve diameter: 1.88"; Valve stem diameter: 11/32"; Valve guides: Manganese bronze; Deck thickness: 9/16"; Valve spring diameter: 1.55"; Valve spring maximum lift: .700"; Rocker stud: 7/16"; Guideplate: Hardened steel; Pushrod diameter: 3/8"; Valve angle: 26°; Exhaust port location: Stock; Spark plug fitment: 14mm x 3/4 reach, gasket seat. INSTALLATION NOTE: Bare heads will have valve guides & seats installed, but will require final sizing & a valve job to match the valves you will be using. Recommended spark plugs are Champion RC12YC or equivalent 14mm x 3/4" reach with flat gasket seat. 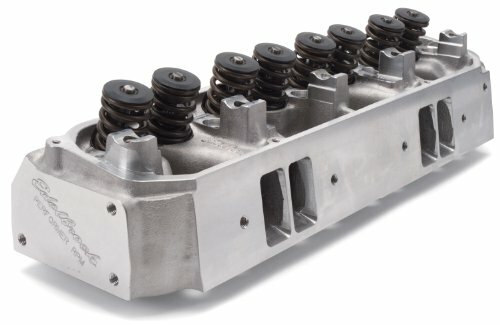 All Performer and Performer RPM Big-Block Chevy heads: Spark plug is closer to center of bore, will interfere with high-dome pistons for open chamber heads. Use pistons designed for our heads. Match with Edelbrock head gasket sets. The Edelbrock Performer RPM Aluminum Cylinder Heads feature threaded inserts in the rocker studs and exhaust manifold bolt holes for superior strength and durability. These cylinder heads offer dyno-proven increases in horsepower, throttle response, and torque throughout the RPM range. These direct bolt-on heads deliver maximum performance in the 1,500-6,500 RPM range for high performance. They offer improved power throughout the RPM range for greater throttle response and top-end horsepower. They have high flow 2.02 intake valves for use with pistons notched for valve clearance and 0.60 exhaust valve. They have the top quality features like threaded inserts for rocker studs and exhaust manifold bolt holes for durability and superior strength, and manganese-bronze valve guides. Cylinder Head Specifications: Combustion chamber volume: 110cc; Intake runner volume: 290cc; Exhaust runner volume: 110cc; Intake valve diameter: 2.19"; Exhaust valve diameter: 1.88"; Valve stem diameter: 11/32"; Valve guides: Manganese bronze; Deck thickness: 9/16"; Valve spring diameter: 1.55"; Valve spring maximum lift: .700"; Rocker stud: 7/16"; Guideplate: Hardened steel; Pushrod diameter: 3/8"; Valve angle: 26°; Exhaust port location: Stock; Spark plug fitment: 14mm x 3/4 reach, gasket seat. INSTALLATION NOTE: Match with Edelbrock head gasket sets. Bare heads will have valve guides and seats installed, but will require final sizing and a valve job to match the valves you will be using. Recommended spark plugs are Champion RC12YC or equivalent 14mm x 3/4" reach with flat gasket seat. 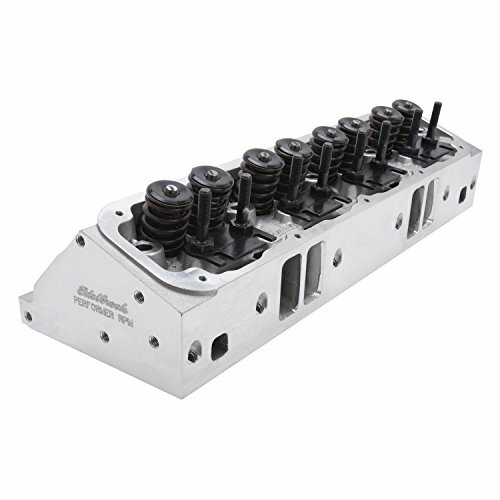 Want more Edelbrock Performer Cylinder Head similar ideas? Try to explore these searches: Bedtime Fashion, Hdmi Format Converter, and Designers Fountain Contemporary Chandelier.